Ben’s Christmas Tree Farm! Christmas as You Remember It. Family owned and operated since 1982. 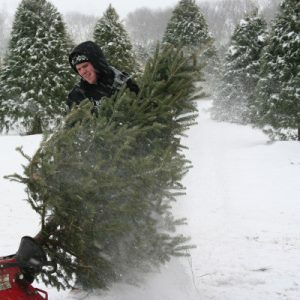 Thousands of cut-your-own trees in 8 varieties of firs and pines, from 6 to 12 feet tall on 55 serene, rolling acres in McHenry County. We use organic farming practices, and all trees are pesticide-free. Complimentary horse-drawn wagon rides, tractor-drawn wagon rides, free shaking and baling, complimentary coffee and hot cocoa, farm animals, nature trail (new for this year! ), Santa Claus, and small play area for kids. We offer fresh, hand-made fraser fir wreaths and greens items. Leashed dogs are welcome. Ben’s Christmas Tree Farm is an enjoyable trip for folks from Chicago and the surrounding suburbs.